These are the things that divide us, a nation of eaters. Smooth vs. crunchy. Mayonnaise: inedible or indispensable? Lengthy recipe introductions that read like personal essays. If you use the Internet as your own infinite cookbook, you know the ones I’m talking about. “It was a dark and stormy night the first time I served Aunt Tillie’s meat loaf to the man who would one day become my husband, although I never would have suspected it then . . . ” The paragraphs meander through feelings, philosophical musings, and memories, often about mothers or grandmothers. They talk about how a particular dish brings the writer back to a moment or a place, how a taste of it has the power to fix a bad day or soothe a broken heart, how the writer now serves it to her own children and it is as if long-dead, much-missed Aunt Tillie is right there at the table with them once again. In other words, they tell us everything but how to cook the dish, which is what we really want to know. These introductions are easy to mock, sometimes worth reading and sometimes decidedly not. They are also easy to scroll through, to reach the recipe that, I promise you, is somewhere down below. This, to me, doesn’t seem like much effort to expend on the way to a recipe you’re getting for free. Yet half the world apparently disagrees. Vehemently. Princeton history professor Kevin M. Kruse nearly started a civil war among cooks recently when he tweeted the following: “Hey, cooking websites? I don’t really need a thousand words about how you discovered the recipe or the feelings it evoked for you. Ingredients, steps, total time for prep and cooking. That’s it. I’m trying to feed my family. No need to curate the experience for me.” His comment sparked more than 2,400 responses, with the pro and con camps equally vociferous. It wasn’t exactly an original thought. Back in August, for instance, a New Yorker “Shouts & Murmurs” column titled “If You Want My Blueberry-Muffin Recipe, You Must Read This Crazy-Long Preamble First” made me chortle out loud. For I, too, have sprained my scrolling finger trying to avoid reliving someone else’s Tuscan vacation en route to her ribollita recipe. But although I may not always long to read these wordy hors d’oeuvres, insisting on their right to exist — their importance — is a hill I will die on. There are, of course, practical reasons for their inclusion. There is search-engine optimization, or SEO: Longer content is generally thought to correlate with higher search rankings (although this is likely an oversimplification, and the algorithm is ever-changing). More words mean more space to embed ads. At their most basic, recipes aren’t protected by copyright: Lists of ingredients with instructions are considered procedures, which are unprotected. But the creative elements that surround them — photos, illustrations, literary expression — these are copyrightable. Long recipe introductions help their creators get recognized and compensated for the work they put in developing, testing, photographing, and more. We cannot expect free content without thought for its sustainability. It’s an exploitive mind-set, and a dangerous one. It’s how we wind up in a world increasingly pockmarked by news deserts. In the best-case scenarios, the mini-essays that precede recipes also tell us something about who the creator is. How can you trust someone’s recipes if you don’t get to know her a little? (Powerhouse sites that generate huge amounts of content appear at the top of every search, but that doesn’t mean their recipes are well tested or consistent.) The people who do this best are funny and illuminating, so that you want not just the recipe for gateau Zoe but the story of how David Lebovitz found it on the men’s room wall in a Paris restaurant, not just the method for making pickled cabbage salad but Deb Perelman of Smitten Kitchen’s tale of her obsession with Zabar’s version. In other words, these people are good writers. It strikes me that what the naysayers may be reacting to isn’t so much lengthy recipe introductions as it is bad writing. 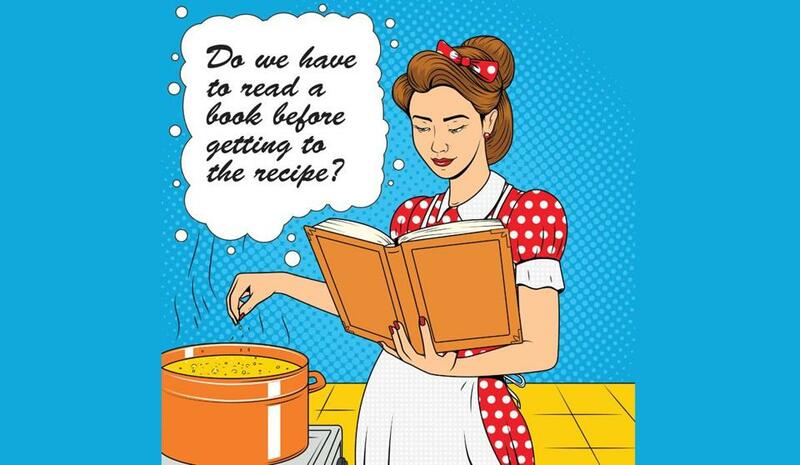 Cookbooks that don’t sell eventually disappear from stores. The Internet is a giant remainder shelf where bad work lives forever. But the Internet is also a space where there is room for everyone’s experience and everyone’s voice. That does not describe the current cookbook landscape, where getting a deal can depend on having a certain level of celebrity, a certain number of followers. The real reason I will stand up for this kind of recipe forever is that I believe everyone should get to express herself exactly how she wants. “I need a language to hear myself with / to see myself in,” as the poet Adrienne Rich wrote. When we are hangry and busy on the way to dinner, we resent having to pause to digest someone else’s experience. Maybe it’s a reminder to slow down a little. To tolerate one another. To not get ticked when someone fails to serve us exactly what we want, exactly how we want it, for free. Because friends, that’s called entitlement. There are all kinds of recipes out there, tailored to all comers: the succinct, the scientific, the process-oriented, the left-brained. There are also apps and extensions and “jump to recipe” buttons designed to help us skip the preamble. If you don’t want to read about Aunt Tillie or Tuscany, you don’t have to. But that doesn’t mean no one should write about them. globe.com. Follow her on Twitter @devrafirst.